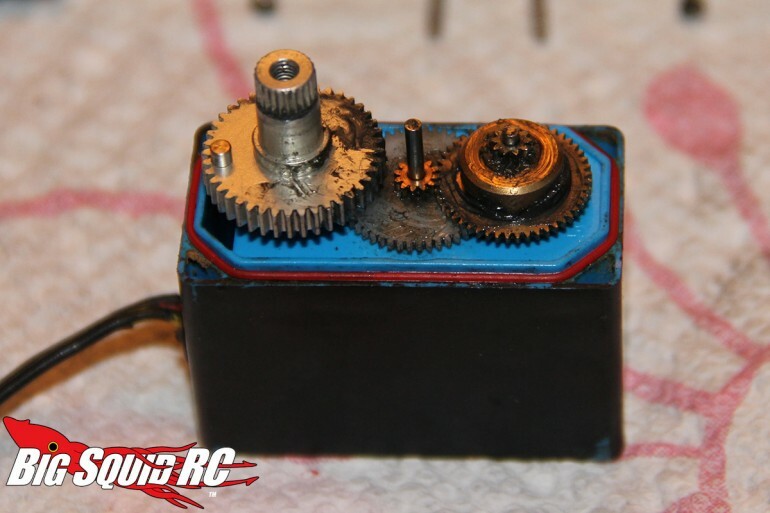 Everybody’s Scalin’ For the Weekend – Rebuilding a Hitec 5646WP Servo « Big Squid RC – RC Car and Truck News, Reviews, Videos, and More! 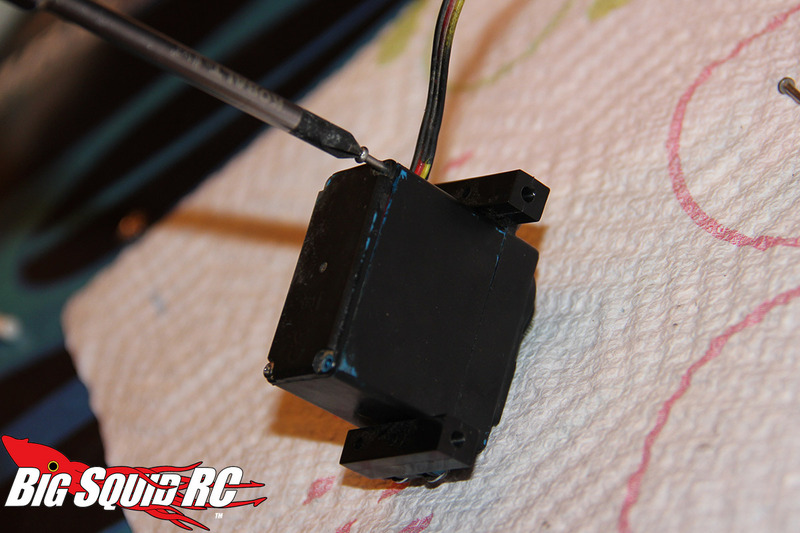 Crawling/scaling can be really hard on servos. Not only are they expected to turn heavy, weighted tires on unforgiving rock, but most of the time there is no servo saver attached. Yep, direct horns are the only way most crawlers roll (versus using a saver that will give) leaving the servo unprotected to absorb the brunt of what’s thrown at it. To make matters worse, sometimes its underwater. I don’t care what kind of servo you have, eventually this type of abuse is going to leave you with broken teeth. Don’t just throw the unit away, though! 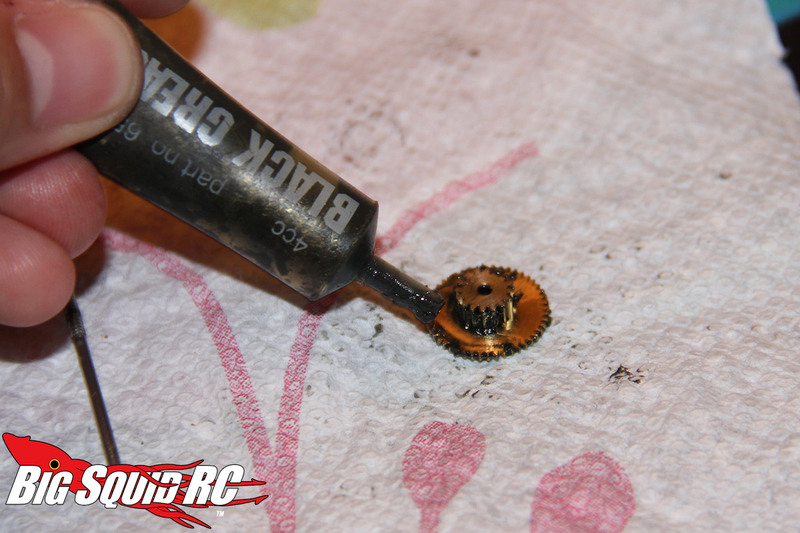 A lot of newbies don’t realize that many mid to high range servos can quickly be fixed by a trip to the dentist (aka your local hobby shop) to pick up a new set of gears. 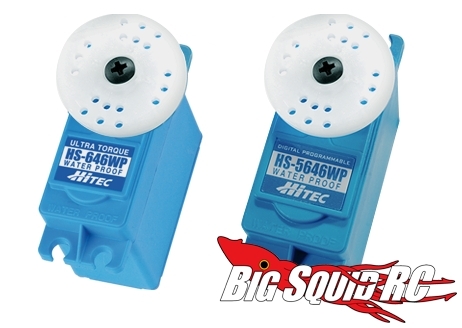 A super popular scaling servo (and bashing) upgrade is the trusty Hitec 5646WP unit. The servo puts out around 150 oz or torque, is waterproof, has metal gears, is digital AND is relatively easy on the wallet at $54.99. I think they are the perfect upgrade for an Axial SCX10. That isn’t marketing garbage, I currently own 4 of them and use or have used them in a variety of trucks; 3 SCX10’s, Wraith, CPE Barbarian, Tamiya TXT-2 and soon to be my new Yeti. Last weekend I finally broke some teeth during a monster truck freestyle session and figured this was the perfect time to show how easy they are to fix. Keep in mind this unit ain’t no spring chicken. It’s about 2 years old and while it used to be blue once upon a time, I painted it black a long time ago and most of it is peeling off after abuse. Click the “Read More” and I’ll show you how easy it is to get the old girl back up and turnin’. Using a small Phillips driver, remove the 4 long screws in the rear case. 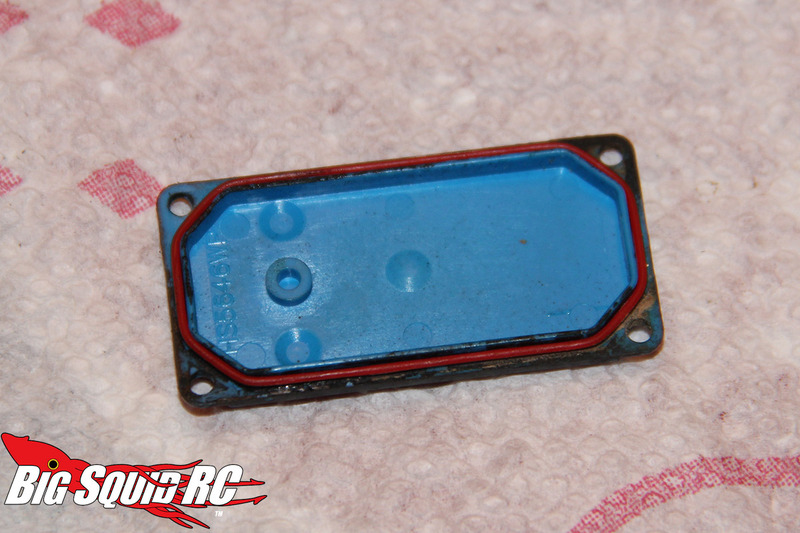 When you take the rear plate off, notice the rubber gasket. It’s what helps keep the gunk/water out. The screws hold the front case on. You can now remove it to show the gear train. The arrow shows the gear missing teeth. 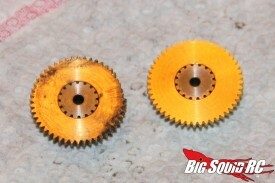 The broken gear is on the left, the replacement is on the right. Where did the new gear come from? Why this bag, of course! 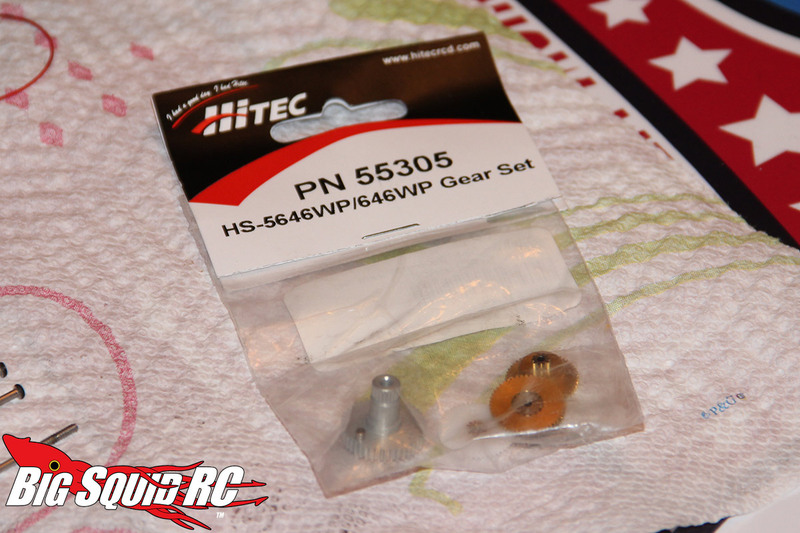 Hitec #55305 will give you spares to do a total rebuild job. Here’s the servo with the offending gear removed, ready for replacement. Notice the rubber seal on the case which I made sure to put back on. Make sure you hit the replacement with some gear lube so it (hopefully) lives a long life. And voila, the new gear is on and works great. 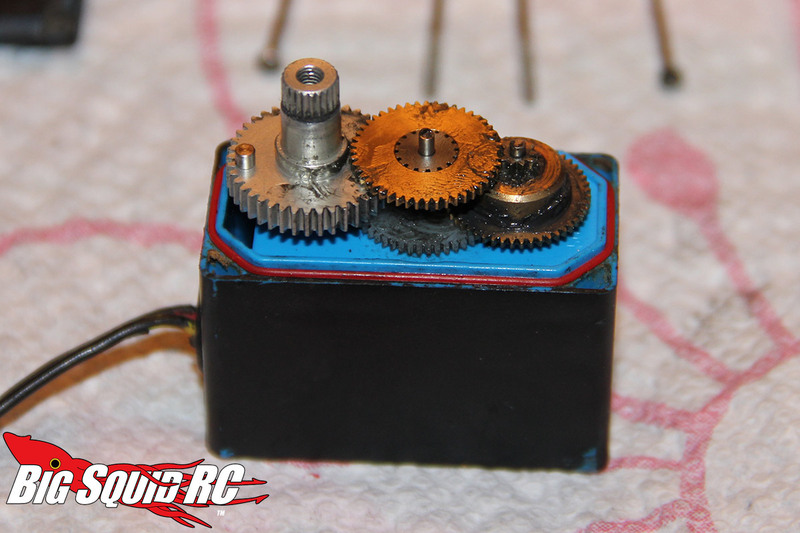 This servo is ready to go back in service after a bit of cleaning. 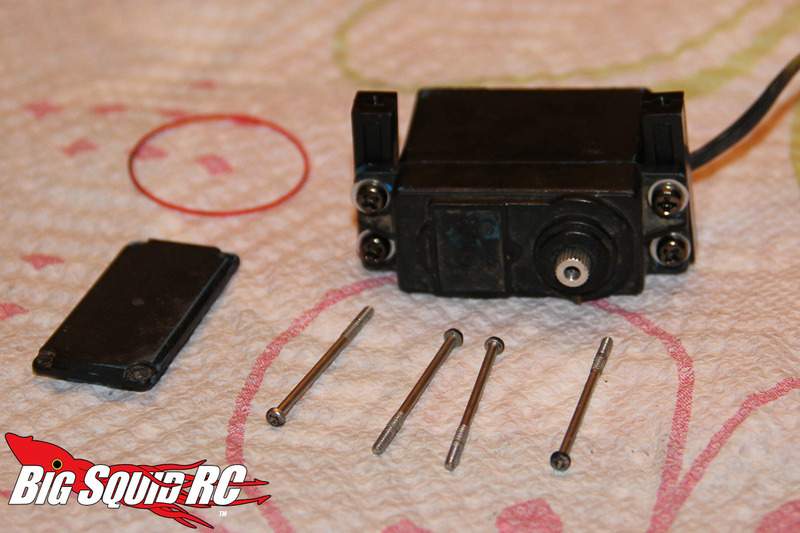 Put the case front and rear back together and you are good to go! Pretty easy, right? In news this week Axial is back at it again, this time announcing an update to the Wraith platform, the Wraith Spawn Rock Racer. It’s been awhile since that platform has been updated (early 2013) so it’s nice to see they aren’t letting it slide despite the rise of the somewhat similar Yeti. And hey, speaking of the Yeti…I finally ordered one. The folks at RPP Hobby sold a few brand new trucks minus the electronics at a discounted price so I jumped on it very quickly. At the time of this writing it’s currently en route from California to good ole St. Lou. I’m really excited to dig in and build a wicked trail machine. Look for part 1 of a build series very soon. See everyone next week! 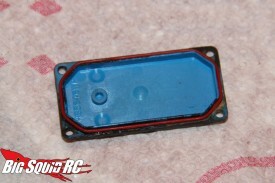 For more Hitec news on BigSquidRC you can click here. Want to see the latest in scale r/c? Click here to make it happen. The screws hold front case on. You can now remove it to show gear train. 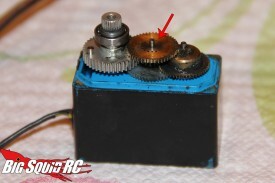 The arrow shows the gear missing teeth. Where did the new gear come from? Why this bag, of course! 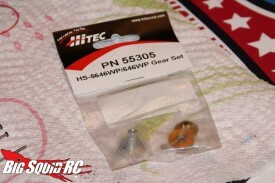 Hitec #55305 with give you spares to do a total rebuild job. Make sure you hit the replacement with some gear lube so it meshes smooth. And voila, the new gear is on and works great. 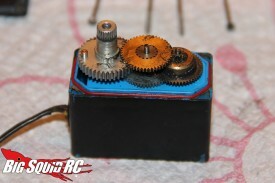 This servo is ready to go back in service.